. IT IS A BEAUTIFUL ENCYCLICAL AND ALL THE FAITHFUL SHOULD SPEND SOME TIME TO READ IT. 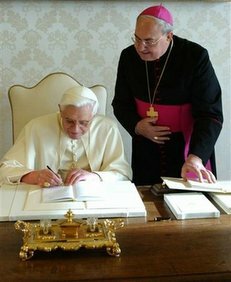 The Holy Father signs his first encyclical. I wonder if he gave it to the Cardinal as his autographed copy. The Holy Father at Vespers talking about his encyclical. 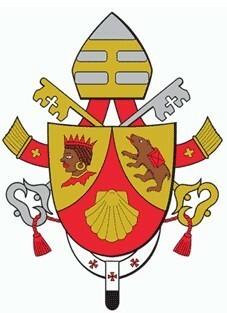 The Curia announces to the International Press Pope Benedict's first encyclical. 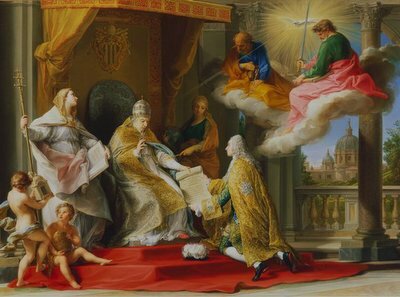 Pope Benedict XIV presents his encylical. Notice how Heaven blesses and rejoices! 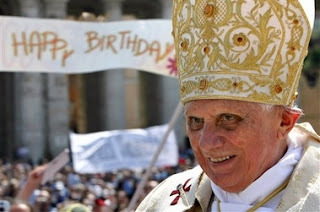 I'm sure heaven is blessing and rejoicing over Benedict XVI's first encyclical as well! My goodness that painting is lovely!! 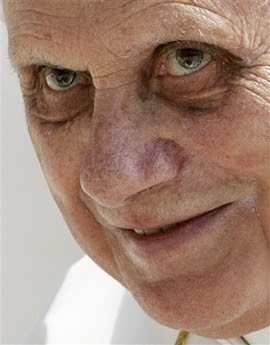 The encyclical is out, wonderful. Oh yes Danny, I agree! What a blessing to have the Pope talk about God's Love during these times of sadness, pain and loss of faith. Carmel, isn't that painting beautiful? 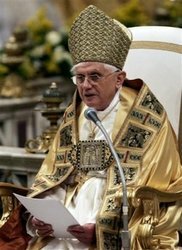 It kind of gives us a hint of the infallibility of the Pope. Thank you for the great photos. Your blog had the best ones. Tima, thank you for the compliment and for dropping by again. It's always good to hear from you. How powerful are those three words! They happen to be my favorite part of the entire Gospel. When someone asks what my favorite verse is, I quote those three words. 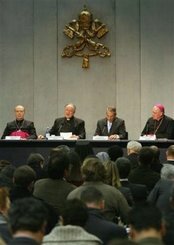 So, I was overwhelmed with joy when I heard of the title of the encyclical. I haven't been able to read too much yet, but what I have read is great. I'm trying to listen to the mp3 audio version and follow along. Moneybags, wow, that scripture verse says it all! 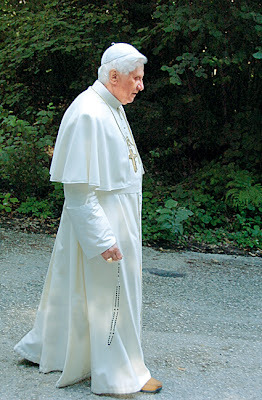 The encyclical must have special meaning for you, being it is your favorite verse.